Long entry following a bullish price action reversal on the H1 time frame immediately upon the next touch of 1.1257. I wrote yesterday that there was a confluence of resistance at 1.1357 so I would be prepared to take a bearish bias in the event we got a strong bearish reversal there later. I thought there would be better opportunities in other currency pairs. I was a little wrong as the price fell during the early part of the New York session with some momentum to break below the round number at 1.1300 and end the day very close to its low. However, relative volatility remained low for this move, so I have no confidence it will carry through despite the clear medium-term bearish trend, partly because we are in an area of long-term support and a very pivotal level at 1.1257, even though we just had a 50-day low close. For these reasons, I would be prepared to get bearish at a rejection of 1.1315 or bullish at a strong rejection of 1.1257. 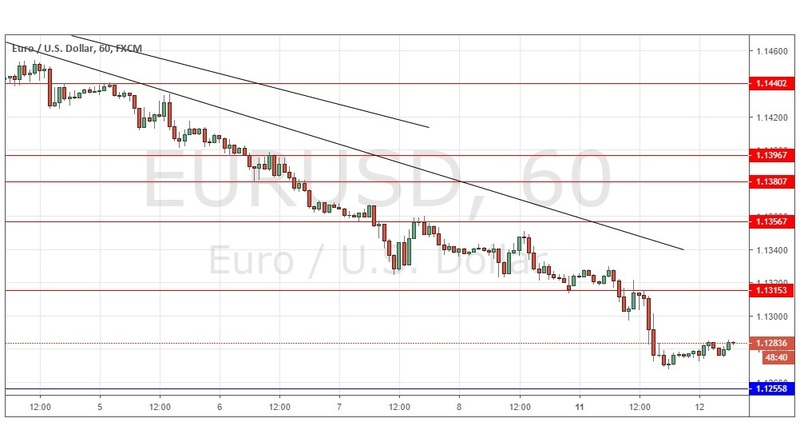 There is nothing of high importance due today regarding the EUR. Concerning the USD, the Chair of the Federal Reserve will be making a minor speech at 5:45pm London time.